In God’s Image: A Global Anabaptist Family: an exhibition of art, daily life photographs and stories from 17 countries around the world with Anabaptist communities was a touring exhibition, created at the Mennonite Heritage Centre Gallery, a ministry of Mennonite Church Canada in Winnipeg; curated by artist Ray Dirks (born 1955, studied at Vancouver Community College, founder and curator of Mennonite Heritage Centre Gallery). In the fall of 1998 Ray Dirks proposed the idea of a global exhibition that would open at the next Mennonite World Conference (MWC) scheduled for Africa in 2003 to MWC executive secretary Larry Miller. It would celebrate the lives of ordinary people from approximately 20 countries and introduce viewers to art from each participating country. He would visit and stay with people who belonged to congregations of MWC member conferences in each country, meet with and commission artists and document the lives of the people he lived with, in words and photographs. The artists would reveal things that he, as a foreigner, never could. The MWC General Council meeting in Guatemala City in July 2000 gave their blessing to the proposal. 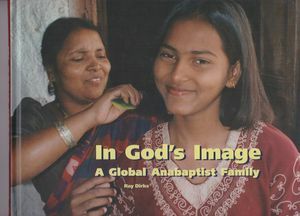 Working through the MHC Gallery, Dirks attracted funding for the project, including the production of a coffee table book, In God’s Image: A Global Anabaptist Family (Herald Press, 2003). The book was sold in North American markets, and later distributed for free in English-speaking countries in the global south where Mennonite World Conference had members. The exhibit included 34 full colour photo collage panels and story panels created by Ray Dirks, and 100 pieces of art purchased from or donated by artists from the 17 countries visited by Ray Dirks. The art, daily life photographs and stories came from the lives of people from Canada, the United States, Cuba, Brazil, Uruguay, Paraguay, the Netherlands, France, Switzerland, Democratic Republic of Congo, Ethiopia, Zimbabwe, Zambia, India, Indonesia, Taiwan and Japan. The exhibition opened in July 2003 at the National Gallery of Zimbabwe in Bulawayo before going to the Zimbabwe International Train Fair grounds for the Mennonite World Conference’s 14th Assembly, also in Bulawayo, in August 2003. In 2004 it toured in the Netherlands, Germany and Switzerland. It returned to its base in Winnipeg in March 2005, where it had its first North American stop, being on display 4 March to 4 June 2005 at the Mennonite Heritage Centre Gallery. In July 2005 it was taken to Charlotte, North Carolina for the Mennonite Church Assembly. When the tour came to an end in 2006, the art works were donated to the Canadian Mennonite University and displayed in the hallways of the buildings on both the north and south campus. In God’s Image is a snapshot of the Anabaptist family of faith as it existed early in the new millennium. There were stories of love, loss, faith and family -- human interest stories that crossed cultures, that helped Mennonites and other people get to know brothers and sisters from around the world. “Art Exhibit creates ‘holy space.’” Courier 18, No. 3&4: 11. Dirks, Ray. In God’s Image: A Global Anabaptist Family. Waterloo, Ontario and Scottdale Pennsylvania: Herald Press, 2003. “Here & There in Zimbabwe.” MHC Gallery Canvass 6, No. 5 (September October 2003): 2. “In God’s Image: A Global Anabaptist Family: art, daily life photographs and stories from 17 countries.” MHC Gallery Canvass 8, No. 2 (March April May 2005): 1. “Just Back.” MHC Gallery Canvass 6, No. 5 (September October 2003): 2. Redekopp, Alf. "In God's Image (art exhibit)." Global Anabaptist Mennonite Encyclopedia Online. 19 January 2016. Web. 24 Apr 2019. http://gameo.org/index.php?title=In_God%27s_Image_(art_exhibit)&oldid=133294. Redekopp, Alf. (19 January 2016). In God's Image (art exhibit). Global Anabaptist Mennonite Encyclopedia Online. Retrieved 24 April 2019, from http://gameo.org/index.php?title=In_God%27s_Image_(art_exhibit)&oldid=133294. This page was last modified on 20 January 2016, at 01:18.